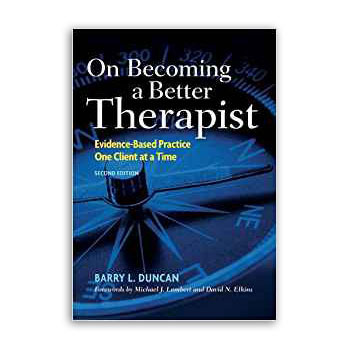 This book describes Dr. Barry L. Duncan’s Partners for Change Outcome Management System (PCOMS), an evidence-based method that provides systematic feedback from clients, thereby enabling therapists to identify clients who aren’t responding to treatment before they drop out. Duncan examines the common factors inherent to all successful therapies and details the importance of the therapeutic alliance as the foundation of effective therapy. He encourages therapists to expand their theoretical breadth, think deeply about the lessons they learn from their clients, and integrate these lessons into their performance. This highly readable and clinically focused book details a five-step plan to take charge of personal and professional development, stave off disenchantment, and remain a vital force for change in clients lives. On Becoming also includes chapters on couple and family therapy, supervision, and implementation. Building on the three editions of Heroic Clients, Heroic Agencies: Partners for Change and almost twenty years of teaching and implementing PCOMS, Drs. Duncan and Sparks break down PCOMS into 10 learning modules addressing the 10 skills of PCOMS as well as individual chapters on couples, families, groups, case management, and child protection services. The Manual also provides modules on the four steps of PCOMS supervision as well as the secrets of implementation. Other features include fast access to summaries of the psychometrics of the PCOMS measures, the rationales for PCOMS, and all the handouts that aid in implementation in one convenient place. 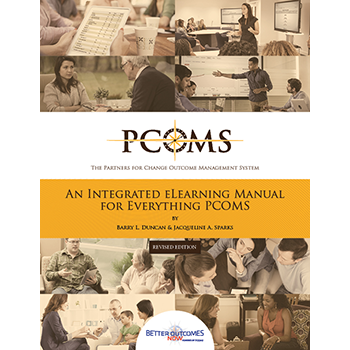 Written in an accessible workbook style (without research) for service and treatment providers of all stripes and flavors, The Manual is integrated with Better Outcomes Now and the PCOMS eLearning compendium of webinars and client videos, providing a full curriculum for orientation of new employees and ongoing PCOMS training. We live in a world pervaded by the unspoken attitude that we are all basically flawed, broken, incomplete, scarred or sick: we’re labeled as dysfunctional, codependent, depressed, you name it. Contrary to popular perception and drug company ad campaigns, fifty years of research shows that positive change does not primarily emerge from examining the disorders, diseases, or dysfunctions—all the stuff that’s wrong with us—that allegedly plague the masses. 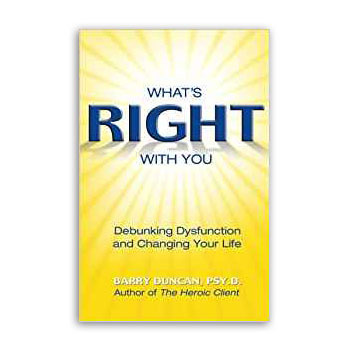 Dr. Barry Duncan debunks the myth that only a therapist can help you change your life and shows how positive change really happens when you utilize your inherent strengths and resources and are supported by relationships that take your innate goodness as a given. What’s Right with You gives you a research validated, six-step plan for a dynamic and refreshing approach to effecting change in your life—for good!